I have cropped and resized this photo for the web. I love Google Search. A quick search for “ *stnut “Opera House” *nbury “ quickly found the Chestnut Street Opera House in Sunbury, PA. The clipping from Donna’s collection provides the other information. The date was February 6, 7, & 8, 1922. The theater was part of the B. F. Keith’s Vaudeville. 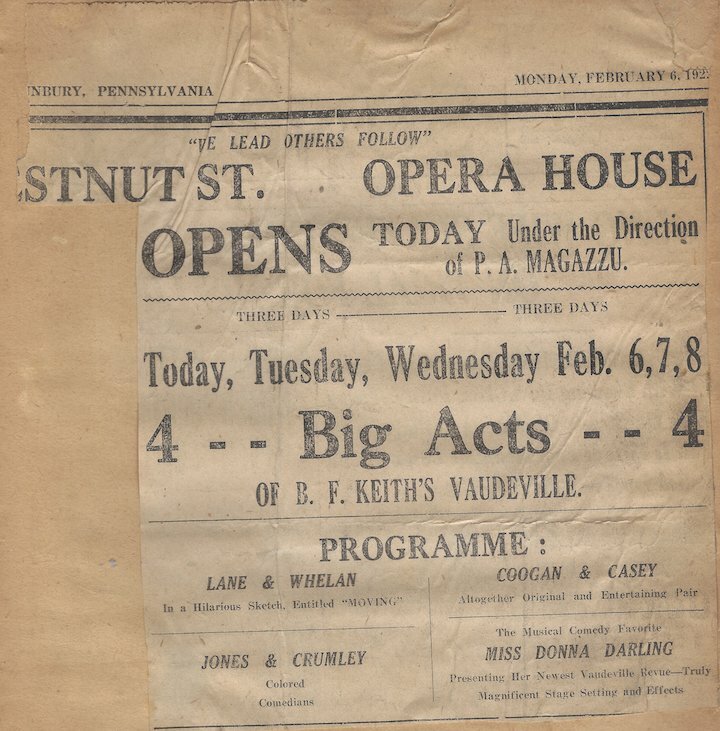 Added another new venue for Donna – February (6, 7, & 8) 1924 – “Donna Darling Presenting Her Newest Vaudeville Revue,” at the Chestnut Street Opera House in Sunbury, PA.